A reasonable quality tent will last a lot longer if cleaned at the end of each season or after a particularly dirty camping trip. It's also a good time to spot any small holes or tears that may need repairing. Plus it will give you a nice feeling when you pull your clean tent out at the start of the next season to see it in such great condition. Normally before rolling up and packing our tent away we just shake out and dirt and sand, but now and again (usually after each camping season) it will need a decent clean. DON'T STORE YOUR TENT AWAY WET. DON'T USE A CLOTHES WASHER OR TUMBLE DRYER! 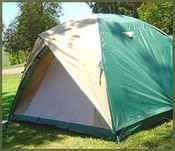 Step 1: Shake the tent out, you can turn it inside out if it's not too large, to remove any loose dirt, sand, etc. Then turn it over and wipe or brush the tent base to get rid of any mud or dirt stuck to the bottom. (Optional) Use a vacuum with a brush to give the zips a clean. Step 2: Erect the tent and give the tent sides / walls a wash with some mild soapy water (not too soapy), don't fully submerge in water as this may damage the waterproof membrane. Step 3: If any sap has dropped on the tent then lightly scrape away with a plastic knife or something similar that won't cut the tent material. Don't be tempted to use a solvent, this will most likely just damage the material. If you notice any sticky sap when packing the tent up while out camping, then put some tissue or paper or even a leaf may do the job, so it doesn't stick to some other part of the tent when rolling up. You may need to leave some of the soapy water sitting on the sap for a little while to disolve and then it should come away. . Step 4: If you get any mildew spots on the tent mix up about 1/2 a cup of vinegar and into a full water spray bottle. Spray onto the affected spots, give a light rub and spray again. Then put the clean tent up with the mildew spots facing into the sun and let the tent dry. The zips that move up and down need some lubricate to stop them wearing. There's nothing worse than a fully intact tent but the zippers are broken! Use a product such as McNett Zip Tech Semi-Solid Zipper Lubricant, 1/2-Ounce to keep them lubricated. If you want a short term alternate while you're away camping then try a small amount of soap or candle wax on the zippers. Due to the sensitive materials used in tent making it's a good idea NOT TO USE ANY OIL SOURCED LUBRICANTS. If you find the zip slider (the bit that goes up and down) is not working properly then try gently sqeezing the corners as shown in the video below with some pliers or vice grips. If you happen to pack you tent up when it's raining or wet, then as soon as you get home unpack it and drape over some furniture or pitch it where it can dry out. Make sure your tent is is stored in a dry place. Spending a few minutes after each camping trip will ensure your tents lasts a long time and saves you money but not having to buy another.